Research focus: Bacterial enzymes that deactivate antibiotics. How do they work? Widespread use of antibiotics fosters the emergence of antibiotic resistant bacteria. These bacteria evolve enzymes that modify antibiotics to make them useless. Jordan Roach studies how these enzymes function, which should help find novel drugs to fight antibiotic resistant bacteria. Jordan is from Englewood, Tennessee, a small town of less than 2000 southwest of Knoxville. He became interested in biology at McMinn Central High School thanks to a great biology teacher, Ronnie Galloway. Taking classes at UT confirmed his interest in biology. 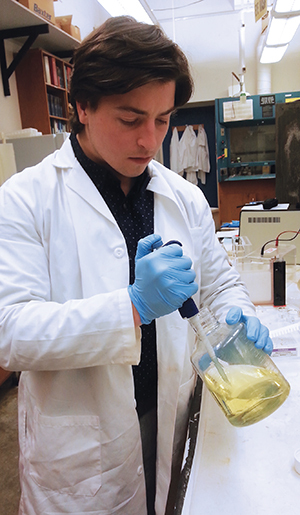 When he joined Engin Serpersu’s lab Jordan wanted to work with proteins on a topic related to medicine. His project was the optimization of expression, isolation and characterization of an enzyme (aminoglycoside N3-acetyltransferase-Ib (AAC)) that causes resistance to aminoglycoside antibiotics. At first this enzyme precipitated during isolation, rendering it unusable, and several graduate students had tackled the problem without success. Jordan took on the challenge and tried a number of approaches that included a variety of expression conditions and even re-cloning the plasmid. By the end of the semester, he was successful in expressing the enzyme in soluble fraction in sufficient quantity for purification and biophysical studies. He is currently trying to determine the kinetic properties of this enzyme. In the future Jordan plans to apply to Medical Scientist Training Programs funded by NIH which will allow him to do medical research. His dream is to specialize in oncology and work at St. Jude Children’s Research Hospital. Last year Jordan received the competitive BCMB Undergraduate Research Scholarship.